After releasing Delete for Everyone feature, Whatsapp has yet released some cool features for the iOS users. 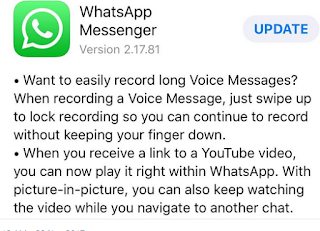 The new features brought along a new version of Whatsapp for IOS v2.17.81 which has started rolling out on the App Store. Record Long Voice Message: When recording a voice message, just swipe up to lock recording so you can continue to record without keeping your finger down. Ability To Watch Youtube Videos Inside WhatsApp Application: When someone shares a YouTube video link to you, with picture-in-picture(PiP) mode, you can watch the video right on the chat without leaving Whatsapp application. With PiP, you can keep watching the YouTube video while you continue with other chats. If you are an iOS user, like i said earlier, the update has started rolling out and now available on the app store for you to update. We hope to see these features arrive on Android version soon. 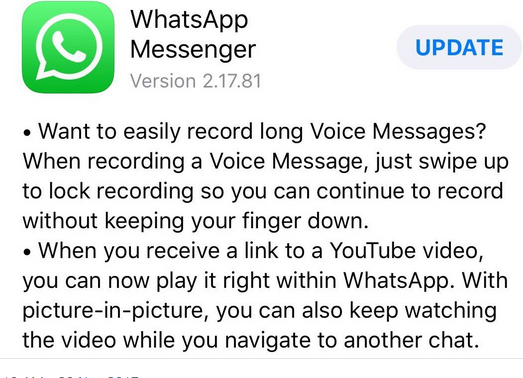 Whatsapp is moving forward, whatsapp is doing great these days. Alright, it's a nice feature. Hey bro I was wondering if there was any specific reason why you switched from .com to .com.ng? Alright bro, I noticed the .com wasn't reaching your blog anymore. It's a very good idea to secure both. You mean the .com doesn't redirect to com.ng? That was before yesterday, it is working now.